Our 200 Hour program has 225 hours of training. 200 hours of the HGYS Yoga Teacher Training Program are made up of elements required by Yoga Alliance. The remaining 25 hours are supplemental topics in Depth Psychology and Sustainable Practices. 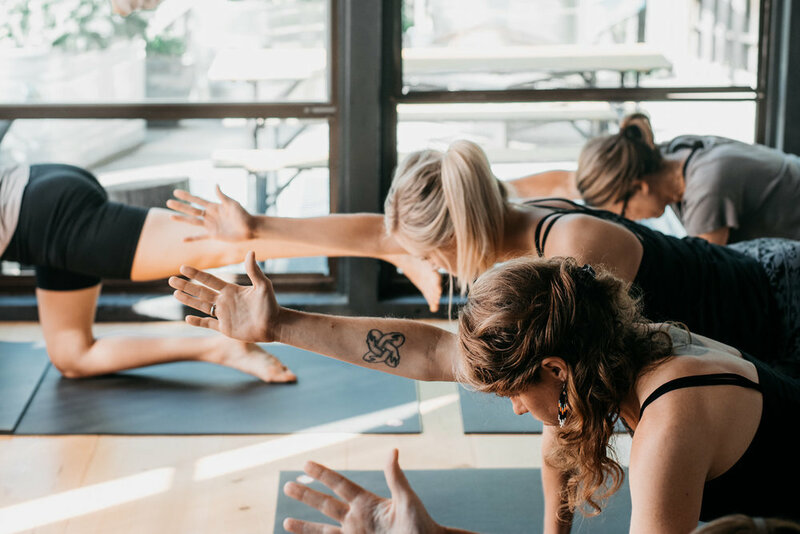 In graduating from the HGYS 200 Hour Yoga Teacher Training Program, you will be certified at the 200 Hour level, and will be able to register with Yoga Alliance as an RYT200. Yoga is an amazing practice with innumerable benefits. What can we do do with the “stuff that comes up” during our yoga or meditation practice? How do we make what we learn on the mat and cushion practical and applicable to daily life? How do we cultivate a practice that is sustainable and lasting, a community which is supportive? How do we connect our increased awareness with action for a better world? Yoga teacher training can give us tools to deepen our practice & then share it with others. What makes THIS program so unique is: the emphasis on classical yogic thought and meditation, learning to practice and teach yoga through a trauma conscious lens, supplemental coursework in Depth Psychology, the Classroom Without Walls philosophy, field trips to farms and urban homesteads to learn about sustainable agriculture and herbalism, and Seva. These aspects deepen the learning experience and thereby the practice, aiding in answering big questions that YOU may ask in the context of your practice and personal spiritual journey. Time is also spent learning postures, anatomy, yoga philosophy, and more. Students will be able to teach foundational techniques, including cueing, adjustments, modifications and variations. Students will leave the program with the basic knowledge required to begin to teach yoga on their own with confidence and awareness. Students will also leave the program with an array of tools to supplement and deepen their own personal practice and spiritual journey, in support of assisting them in living their values. The HGYS curriculum combines classical yoga, seated meditation practice, trauma informed yoga, the richness of depth psychology, and sustainable practices to create a holistic and balanced training program that serves the whole person -- mind, psyche, body, and spirit -- while honoring our connection to this vast Earth. Students in the HGYS YTT program can expect small class sizes and one on one attention while learning in community. Students will gain knowledge of the yoga tradition, explore what yoga means within the context of modern life in the west, and explore sustainable practices such as gardening, composting, food sourcing, sustainable agriculture, urban homesteading, herbalism, and more. “The House of Gathering Yoga School exceeded my expectations in preparing me to guide and teach a yoga class. They gave me the tools, resources and awareness of how to better nurture others while at the same time caring for myself. I will carry these values and lesson with me throughout my lifetime and bring them into my teachings! Thank you for such a wonderful experience and I highly recommend this school to anyone with aspirations of becoming a yoga teacher!” -S.L. “I had great expectations for my YTT journey but I've been blown away by my experience. While we've covered the history of yoga, ayurveda, depth psychology, and anatomy, among countless other things, I've also gotten to know myself so much better along the way. To say it's been an incredibly journey would be putting it lightly. I can't thank the teachers and my fellow cohort enough.” -M.H. "It is difficult, perhaps impossible, to convey how HGYS has changed the fibers of my being. I went in a loose set of strands splaying in every direction and came out a carefully woven rope with the tensile strength and flexibility of a tried and true halyard equipped on a seaward vessel, destined to sail on for eternity. From the lessons on herbalism, discussions of the Hero's Journey, dream tending sessions, to the silent retreat and everything in between; there wasn't a moment that wasn't impactful. Everyday I find a sense of gratitude for the knowledge, experience and support I've been given, as well as the sincere community I have found in my fellow cohort members and instructors alike." -R.R. “Honoring an impulse to “not overthink,” I enrolled with House of the Gathering and became a member of the school’s first cohort. My YTT experience was profound, challenging, and beautiful. I grew during those seven months in ways that could only have happened because of HGYS’s training and the support from its faculty and the support from my cohort. I could not have known what I was signing up for, and I’m so grateful and happy that I did.” -D.C.
House of the Gathering Yoga School is accredited as a Registered Yoga School with Yoga Alliance. Those who complete this Teacher Training Program may register with Yoga Alliance as an RYT 200. The 2019 training is now full and registration is closed. Visit the link below for your Teacher Training application. Please print it off, fill it out, and mail it to the address listed within. We want to create a space where the teachings of yoga and meditation are accessible to everyone. In that spirit, House of the Gathering Yoga School is implementing a sliding scale system for tuition starting in 2020. Stay tuned for more details. Need to know more? See below for a sample of our Yoga Teacher Training weekend schedule. You will see there are three full days of training (per month), and a thoughtful balance of asana practice, lecture, meditation, rest/meals, and workshopping.